Kathy Yuen (Tong Yi) and Benny Lau Wai Heng two nights ago attended their film WHEN SUN MEETS MOON (MAU YUT MAU YUE)'s special screening. Former DJ Lau Wai Heng's director turn received support from 80s and 90s singers like Rita Carpio (Wai Yi Shan), Sarah Wong Bo Yan, Timothy Wong Yik, Elaine Ho Yuen Ying, Jacqueline Man Pui Ling even brought her daughter. On such a rare occasion to get together, they naturally had to talk about their past. Lead actress Tong Yi said that earlier when she attended the cinema audience appreciation, she was surprised to see a male viewer in tears. 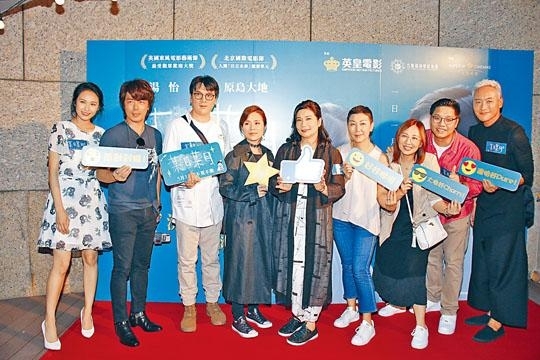 She said, "Because the movie is very touching, with a lot of family, or everyone might have experienced long distance relationship and it is a school story, so it is easy to relate." In real life she said that she has not experienced long distance love but believed that she would be able to accept it, because having her space and distance she would be better. Instead seeing each other everyday the relationship would become a habit you become accustomed to. Would she not want to be too dependent on her ten year boyfriend Ken Hung Cheuk Lap? Tong Yi said that she has always been independent and would play the role of a caregiver. The most important in a relationship was communication, not to throw a tantrum or end up in an argument whenever problems arose. Although they have been together for ten years, Tong Yi was in no hurry to wed. She and boyfriend have an understanding to continue to work hard on her career, before age 35 they would not consider marriage. Wai Yi Shan and Wong Bo Yan both said that seeing the film poster they would be reminded of her first love. The former who starting working very early on said that her first love was not romantic at all, maybe becaus she was more tomboyish. Wong Bo Yan said that information technology was not as developed back then, often she had to hold a pillow and wait for his call at home. Wai Yi Shan said, "After I started working a guy wanted to pursue me and constantly wanted to ask me out; but back then I had to work and sing, after work I would rather go home and sleep. Finally he really waited for me to wake up. However he asked for a month before I agreed."